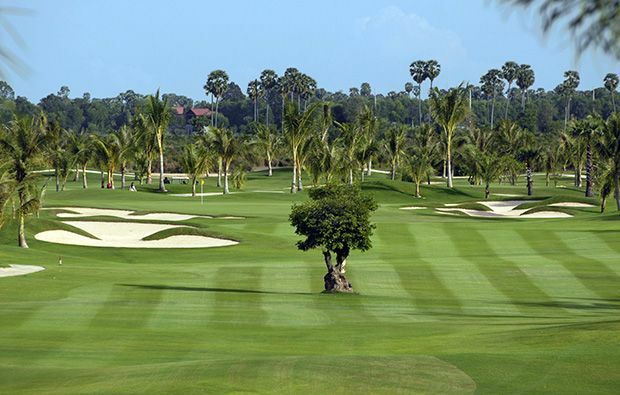 Host of the 2010 Cambodian Open and conveniently located between the airport and Siem Reap, not too far from the famous Angkor Wat temple complex, Phokeethra Country Club has proven an excellent addition to the emerging roster of courses in Cambodia since its opening in 2007. 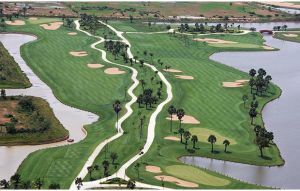 It’s a challenging championship calibre course with more than enough to test the professionals, let alone the rest of us – with water on every hole bar one it’s best stocking up on extra balls at the pro shop before your round lest you find yourself overly familiar with the natural lakes and streams which repeatedly intrude upon the Paspalum fairways. We’re sure that someone out there is making a fortune collecting all the balls that end up wet. There some nice variety over the 18 holes, with bunkers and trees keeping you driving straight, but it really is the water that will cause you the most problems. You must cross water twice on the par-5 4th, and the pin position at the par-3 5th forces you to flirt dangerously with the lake in order to get close. The 6th, 7th and 8th offer no respite, bearing as they do an uncanny resemblance to the film Waterworld. If at the turn you happen to be experiencing any fleeting pangs of guilt at playing golf when there are such magnificent ancient sites to be seen in the area, the course provides one of its own, in the form of the restored 11th century ‘Roluh’ bridge between the 9th green and 10th tee, which is also used as the club’s logo. 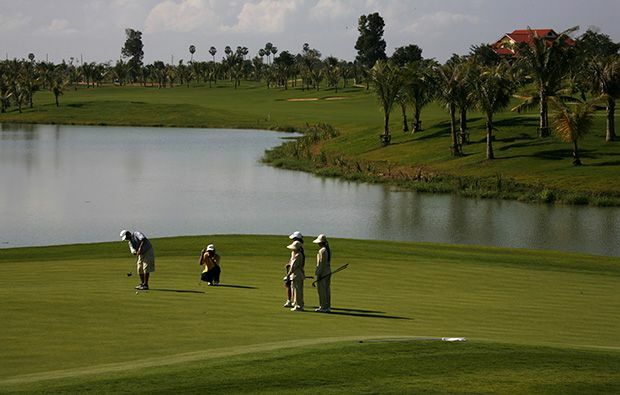 This doesn’t, however, signal the slackening of the challenge as the back nine isn’t any easier than the front, with slices and hooks being harshly punished, especially when it comes to the double water carries on each of the last three holes. 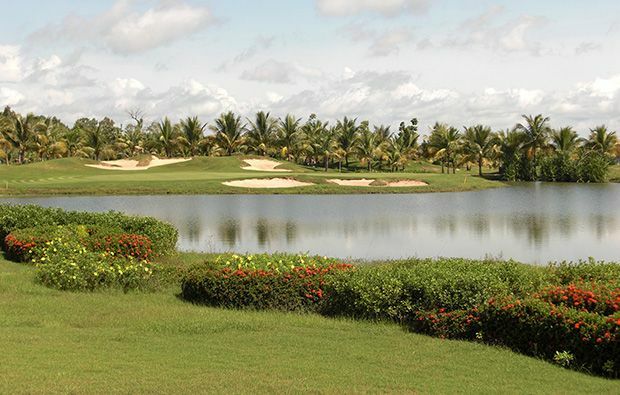 Probably the pick of the holes is the signature 18th, which involves the aforementioned double water carry as well as inviting you to land your ball on a sloping island green. It’s easy to imagine the some decent scorecards being ruined under the pressure exerted by the last, which makes it strange that at professional tournaments they always play the back nine first. Perhaps they need the opportunity to recover the inevitable dropped shots. One nice touch here is that the scorecard features a diagram of each green, split into six lettered sections so your caddy can tell you in which one the flag is located. To be honest you’re gonna be grateful for any little help you get round here, as it really is tough to score well with the course seeming to home in on and punish you for any flaw in your game. The caddies are pretty helpful, so it’s worth taking their advice on board. 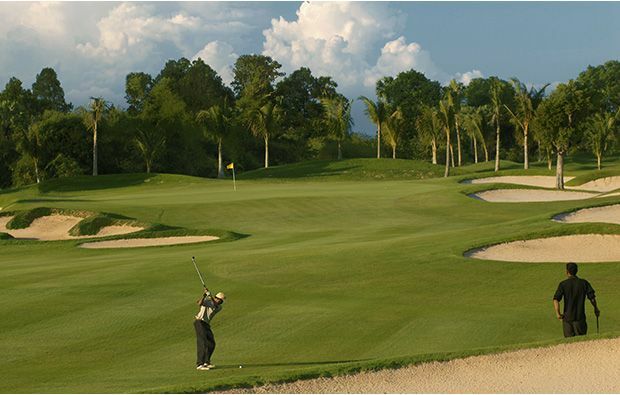 Away from the course itself, Phokeethra Country Club boasts five star facilities, with a driving range as well as separate pitching and putting greens, all of which you are advised to make full use of before venturing you reach the 1st tee. The locker rooms are plush, featuring teak lockers and spa facilities, and the pro shop fully stocked with all the latest gear. 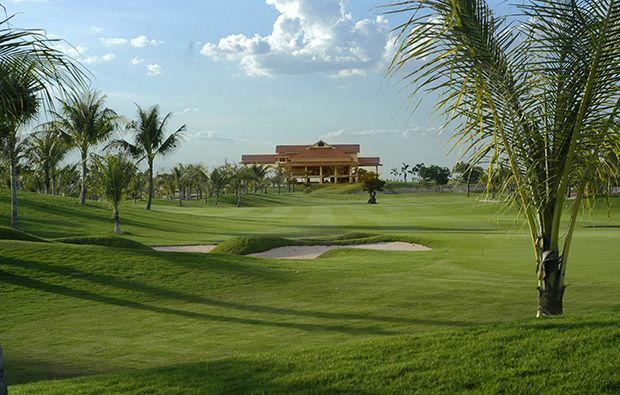 The clubhouse itself has the feel of a private club, and is a great place to unwind after a round or simply tuck into a meal at the onsite restaurant, which serves a decent selection of Western, Khmer and Asian favourites. After that, those staying at the nearby Sofitel Angkor Phokeethra Golf & Spa Resort (owned by the same management) will get free transport back to the hotel. It’s really easy to book tee times at Phokeethra Country Club using Golfsavers’ booking engine although the course can sometimes get crowded at the weekends. Phokeethra Country Club has different Services to offer. Choose a date and number or players to see the rates.